We have 3 children: MacGregor, age 8 and Gracie & Jamie, identical twin girls, age 6. The kids have all been on sleds since age of 3. Mac won his first 4 dog race this past winter in Athabasca, Alberta and I've been introducing him to skijoring with our retired, slowed up Siberians. He's an avid skier and seems to enjoy the skijoring as long as the dogs are tired out first! 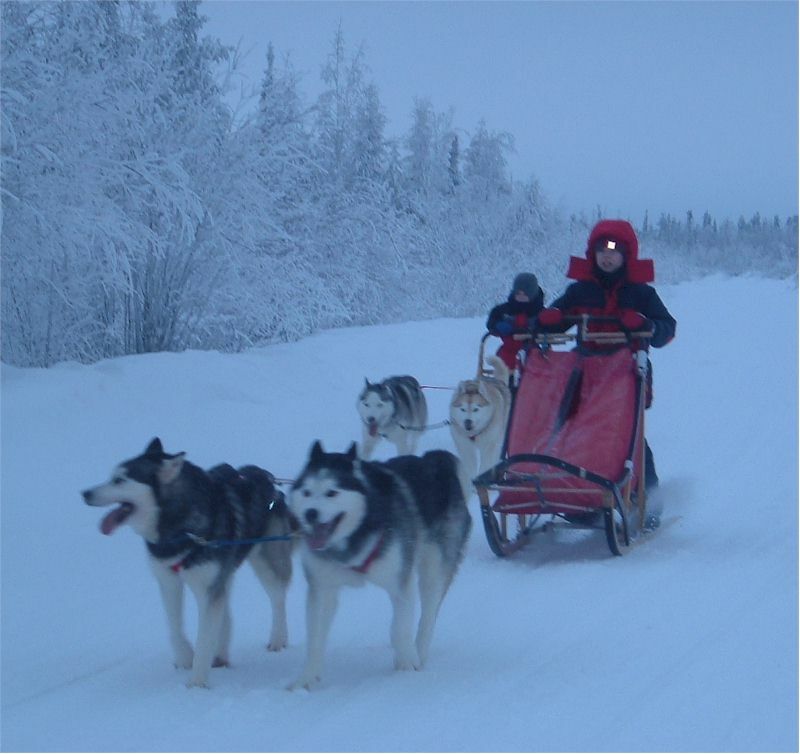 The girls LOVE to get on a sled every chance they can, which we wish could be more. The Ramsay Youngsters starting right! This past winter, we started a tradition of leaving Sundays open to "kids" dogs only. We put the day aside just for them and take a day off from running any of our competitive teams. This way they don't have to wait around for their turn, and we can give them as much time as they want on the sleds with their chosen dogs! It's been the most positive idea we've ever come up with where the kids are involved as we found they were always waiting until we were done, and then they were either too cold or tired to really enjoy their own time. Rob works full time as a pilot in the Canadian Armed Forces and dedicates every other minute to family and dogs. We also board dogs, so I am busy with that during the day and our Canadog Supply business really took off this year and became my full time vocation. Sewing skijor belts and harnesses, collars and now getting into blankets and belly covers keeps me very busy all year round. We are members of the Yellowknife Dog Trotters, NWT Dog Sled Association, Ma-Mow-We-Tak, and have been members of ISDRA and Mushing Canada. We were so surprised 5 years ago, when we showed up in the NWT skijoring around on the trails and lakes, to find that few people knew what we were doing. We've been introducing the sport of skijoring in Yellowknife and this year had up to 12 competitors at our fun races! We are in the process of registering ourselves as the NWT Skijoring Association. We feel it's important to bring skijoring out from the umbrella of the various sled dog associations and cast some independent recognition towards it. Skijoring needs to "grow up" in North America, and anything we can do to bring about an attitude which lends to people looking at this as a serious competitive sport is needed and welcomed. Shelley: It's always changing like the weather, however we are committed to Skijoring and Sprint (4 & 6 dog). 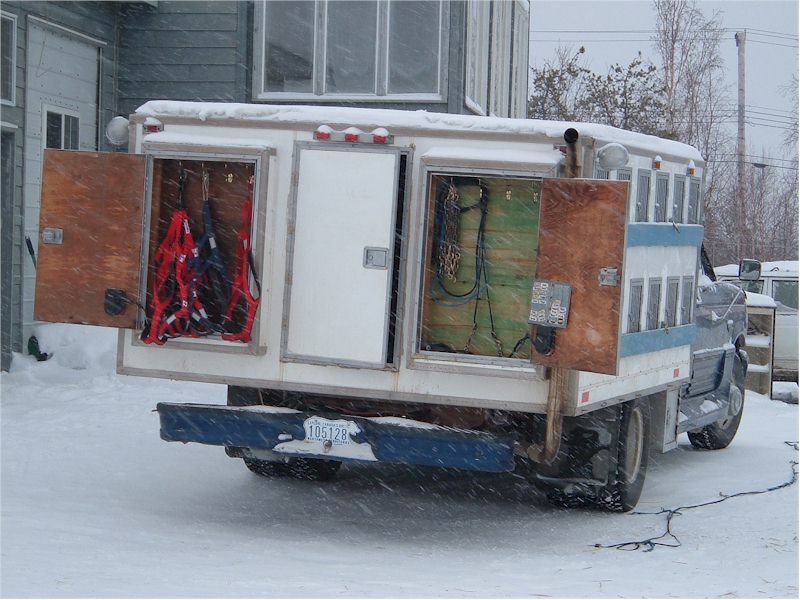 Shelley: We've began Skijoring 8 years ago with our Siberian house pets and graduated to the sled about 4 years later. 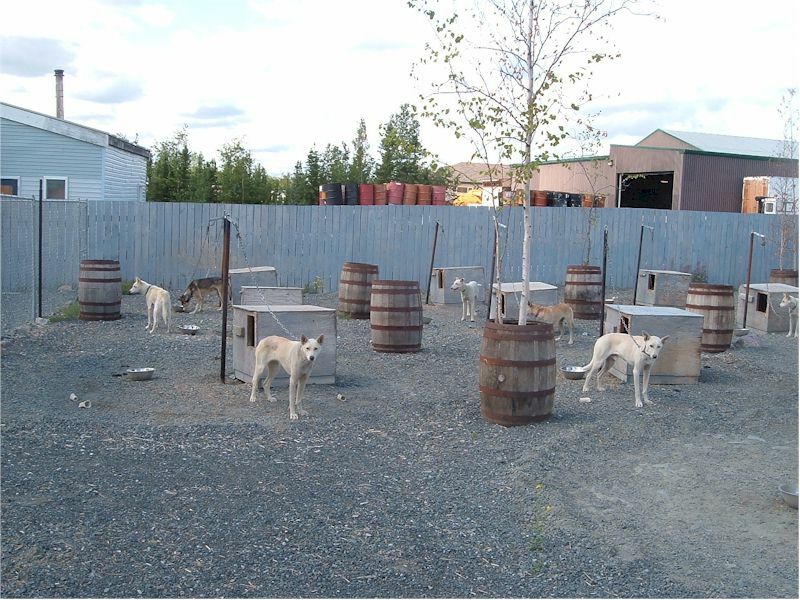 We've been running a kennel of 18 dogs (6 Siberian, 12 Alaskan) for 3 years and this past year we added a 6 dog Alaskan team purchased from Scott Howie and Sarah Parker. Shelley: We used to free run our Siberians on the grid roads in Saskatchewan. When our little female joined our big male, we used to let him run out by himself for about 5KM to tire him out a bit, and then we'd neckline our young (few months) girl with him and he'd teach her to stay with the jeep and run out front and straight ahead. At the time, I didn't know it was even called a neck line, and when they run in front of the jeep, I'd get the strongest deja vu. I didn't know what it meant until much later when I'd see the tails up and the two of them necklined out it front of me on snow. Shortly after discovering skijoring, we entered our first race in Canmore, Alberta, winter of 1999. Shelley: I don't know that I recall a specific first time. 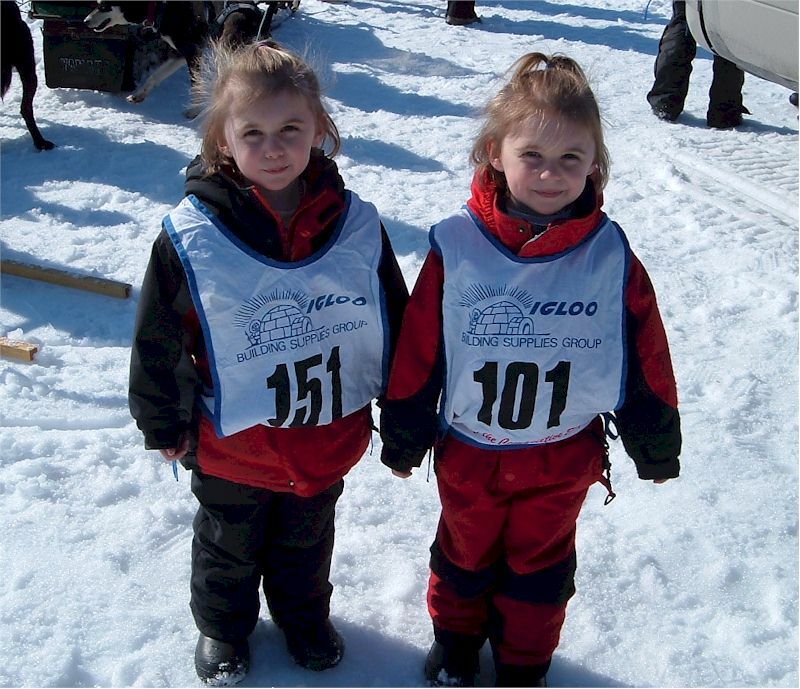 I vividly remember my first skijor race! I've written a story about it on our web site www.canadog.ca called "Barnabus", which I invite you to read. There are so many "firsts" with dog teams that I recall. First time I lost a team, first time I saw a leader shoulder a dog over to take my command, first time I took our new high power dogs (Rob's dogs really) around a 6 dog race by myself, first time I mass started with a 4 dog team and hit the trail first! One thing that really stands out after experiencing a new "first" with the dogs is that we discover, the more we learn, the less we know. Shelley: There have been many. We can't say enough about all of the people who we've prodded tirelessly with questions over the past years, all whom have generously taken time and presented honest, valuable information to us. We have always thought the world of Scott Howie and Sarah Parker, and having their bloodlines in our yard to begin our kennel, we couldn't believe our opportunity to acquire 6 of the best dogs they ever raced! It was an honor to bring them in our yard, and it's hard to stop calling them "Scott's dogs" when we refer to them! Other names which pop into mind are the people who have been a part of our circuit over the past 8 years. Doug Ebbert, The Wannamakers, Rob Peebles, Grant and Nancy Marsh, The DeCoffe's, and anyone else who had to withstand Rob bending their ear all weekend! In Skijoring, we always loved when Tony Fiala was on hand. Now, living in the North, we have Grant Beck and Frank Kelly as our neighbors and guys like Sam Perrino, Marcel Marin, Richard Beck, John Beck and Warren Palfrey dropping in to buy harnesses. We usually corner them and pick their brains before letting them go! Shelley: We have 6 Siberians (4 of whom are aging and recreational, the other two are stellar Wannamaker leaders) and 18 Alaskans. Rob: The poles are 2.5 inch diameter used drill steel and they stand approximately 5 ft above the ground. The swivel arm consists of hardware I picked up from the local store. Chains are approximately 6 ft long. This system allows the dog to make an uninhibited circle around the dog house. Dog bowls are the large stainless steel mixing bowls from Wal-Mart ($4 ea.). 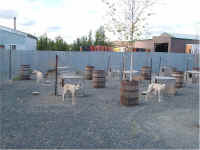 We also have a dozen 10 ft x 10 ft chain link kennels attached to two separate 30 ft x 60 ft play yards. Shelley: There are a few which fall under most important. For us, it's safety, cleanliness and comfort. I don't believe you can separate these three elements and it's hard to say which comes first on any given day. It's essential for us to see our dogs mentally relaxed and showing signs of interest, curiosity and contentment. I guess you could say overall, a "happy" bunch of dogs. Keeping them safe, giving them a clean area and checking them for signs of discomfort and acting quickly to alleviate this all seem to add up to a desired result for us. Our dogs trust us, and we've been told by some of our mentors, that they recognize that we get a lot out of our dogs on the line. It's also extremely important for us to get our dogs off the chains as often as possible during their off season. We have chainlink play/socialization yards which we rotate them through on a regular basis. Our location doesn't offer any free run roads, but we'd surely take advantage of that as well if we could. But, we see the confidence and contentment really take effect when the dogs get a chance to be dogs. Sniff, mark, play, lay where they want and run if they want. It's also doesn't hurt our confidence or contentment to enter the yard and have 6 or 8 dogs approach with smiling faces and gather around because they choose to hang out with us. Shelley: We feed primarily Eagle Pack Power formula and supplement in the winter with fat trimmings we get from the butcher. When we're on the road, we use a mixture of oils (canola, corn and fish) as it's easy to store and purchase if we run out. We grind up kibble into a powder to bait water, so we're not introducing anything new to their systems on race day or training days. An open mind is important with nutrition as different dogs have different needs. Our Siberians barely get a sniff of food in off season as they balloon up immediately. Rob feels our Alaskans for weight on their bellies nearly every feed, as this is where the sighthound body type will tend to hold weight and we've learned not to go by ribs and hip for weight assessment. We are always working with keeping weight on some of our Alaskans, even through the summer. We've been fortunate that all of our dogs to date have done well with our kibble/fat diet. We'll always be open to change if we see problems arising. Rob tends to be incredibly pro-active in the area of food and nutrition and spends much of his spare time studying any literature he can find and asking many questions to other mushers. We feed once a day, and water about 2 hours after. In the winter we bait the water always. In the warmer months when the water won't freeze over, we put down just fresh, clear water. Shelley: We do a round of "poop patrol" every morning and several times throughout the day if we're in the yard, touching and bonding with each dog every time we pass their house. The poop patrol is our time to feel and do a physical and mental analysis of each dog every day. Play and socialization in the off season is crucial for maintaining our goal of keeping a strong enthusiasm, curiosity and mental energy in the yard. Our kennel will inevitably age, and we'll ride whatever race they can manage to give us! We attach to our dogs and they'll live out their lives here. We like our kennel size and don't intend to grow beyond 20-24 dogs. We spay and neuter all dogs except for a select few who are worthy of continuing a bloodline. We'll bring in new dogs, or plan a litter as the numbers sadly drop away. For now, we remain content running our personal "races" within the race and taking a certain glee out of knowing what our dogs just accomplished next to the expectations we had of them going into a particular race. We find it more exhilarating to run a team of "underdogs" who may perform with greatness, than to take around a team who you expect to win, and maybe only come in second place. But, we have nothing against winning now and again, either! Rob: Alaskan Husky bloodlines primarily back to Ed Jenkins' "Slim". Siberian Husky bloodlines from Rick and Dena Wannamaker and traced back to Doug Willet's "Race". Rob: Evenly proportioned / smooth gait / dense muscle mass. Generally termed more "Houndy" and "Leggy". Limited Dog weight of 50 lbs plus. Good Eaters. All our dogs have a place somewhere on a team. We will match dogs with similar abilities. Shelley: Sociable / happy / willingness to run fast. We have found that some dogs do have special needs and we have learned to happily adapt with what we have. The trouble dogs have been our best teachers when we take the time to figure them out. There is also a sense of relief we get from the dog when we finally address him to his proper place and solve his puzzles. Sort of like, "Oh, you finally GET me! Now I can buckle down and give you all I've got," and they do! Shelley: Of course our first dogs, Barney and Summit (who still rules our yard) will always be set in stone as our favorites because they set us on our life trail with dogs. There's a particular fella in our yard, Diga, who had every problem you could imagine coming to us at about 10 months old, green and aggressive. He had an ugly gait, we couldn't trust him beside anyone on the line, and with all the head on passing that we do on the trails here in Yellowknife, we'd have to pull off the trail so as not to offend any of the world class mushers coming straight at us with their 16 - 20 dog trains. This dog eats like he's not eaten in weeks and never will again, he drinks the same way, he pees like this, he runs around his dog house with the slightest movement in the yard like he's going to take flight and when you look at him, his whole body quivers waiting to be touched and then he melts into a puddle. As enthusiastic as he is, we found out he's also as smart, and with some dedication and stern training he's become invisible on the line (we still have to watch him with some other males, of course) passes without incidence and socializes well in the yards. He's been our greatest teacher so far as we were as green as he was when he came to us. He is such a blast to hook up because he's always ready and we still have a tendency to stay alert and on our toes when he is on the line, which we should be doing anyway. He's not the strongest dog we own, but when a dog gives you 150% passion with everything he does, who can resist! This is such an unfair question, getting a musher going on a favorite dog or two! To sum it up, every dog has earned a special place with us and depending on the day and depending on the run or activity, they've all been the favorite at one time or another. Rob: Slow (only as fast as the slowest dog is pulling but keep a lope), small teams (ideally beside a calm and experienced dog), short distances (initially one mile max). Keep it positive. Shelley: Slow starters or tentative puppies take well to being harnesses trained while skijoring as opposed to being hooked up in a large, intimidating team. Another advantage to the sport of skijoring. After the run, we work on letting them free in the yard and calling each to their box for a small treat or just positive affection. This free time after a run will become important if we think anyone might have strained something on the run and we want to take a look at their gait for possible soreness or limping. The Siberians have their free time in our fenced area as opposed to our open yard with exits all around, as they are Siberians. Rob: Sociable / willingness to run in harness. Rob: When it can do the pace required with the team it's training with and complete each distance happy and wagging at the end. Rob/Shelley: Race like you train. Run enough times in enough conditions so you know the dogs. Use your best leaders sparingly. Never compromise their trust by asking them to do more than they should. If you stay within their boundaries, they'll continue to rise to whatever challenge you set before them. It's up to us to always select situations which will set them up for success. If they fail, it's because we failed them. Rob/Shelley: Line discipline during hook-ups. We've been to races with a team of 8 yearlings, and we needed 8 handlers! Our dogs have created a reputation for themselves on our circuit of being a little crazy on the line. Nothing dangerous like line biters or fighting as we crack down on that before it can ever become an issue. They are just overzealous, jumping back and forth and on each other. It's something we wavered over, wondering if we should allow them time to grow out of this. The growing up is over now, though, so we intend to put in a great deal of time standing on the line and not necessarily going anywhere. Clean passing is always an issue here, as the trails are very busy and at anytime you can expect a head-on pass on a 3 foot wide trail. We find our training is more stressful than the race circuit as we run into stray dogs, animals, tons of team traffic and many other interesting events which don't usually happen on race day. Fall training with the quad is for sorting out all these wrinkles. Once we're on the sled, we'll work up distance and then speed. These will be our considerations right up to race time, hoping to have everyone in a comfortable placement, before January. We're blessed with the assurance that winter and snowfall are inevitable here, so we can set realistic goals for sled training. We don't train on poor trail conditions and have so far been injury free. If you wouldn't race on it, why would you train on it? One of the most important things we've learned is to keep your mind and eyes wide open all year. Just because that dog's a wheeler in September, doesn't mean he might not be leading to the finish line by February. Rob/Shelley: Projecting ourselves with a calm, assertive confidence that places us at the top of the pack. It's important to us that we determine each dog's strengths and focus on them, rather than applying energy and time to their weaknesses. We used to spend a lot of breath and time commanding to the weakest dog on the line, trying to bring him/her out of whatever he/she was doing; lunging out to the other team on a pass, for example. We've learned that by projecting positive energy forward to the front of the line and reinforcing their good passing behavior, the rest of the team feels more confident because the energy of that situation (passing) is all positive, and the offender is not the center of what is happening. In doing so, I also believe that we pass an amount of power to those front dogs (who are deserving) and the offender is more likely to become a follower. Rob/Shelley: Having a snowmobile for safety and control has allowed us an incredible amount of freedom and peace of mind during snow training. It allows us go get out a little earlier before it's safe to set a hook. It's allowed us to pace the teams when working up for distances and it also allows us to always go out and be a safety spotter for each other when we do get on the sled. Even though we train on a very predictable, flat lake loop, we're still running dogs, and we feel there's nothing predictable about that. Ever. So, we like to always take extra precautions to keep each run as in control as possible. A snowmobile is definitely our most indispensable piece of equipment. Rob: We usually choose events which include a skijor event in their purse. Rob: Patience and physical ability. Shelley: I feel I have real connection with my dogs and can read them mentally. I don't know if it's a maternal instinct at play, but I feel it allows me to know when I can push them a little harder and when I need to back off, stop racing and let the dogs just run it out for that particular day. Maybe this maternalistic attitude keeps me from pushing my teams as hard as someone else might, but I've always got a happy team at the end of day two and I've never injured a dog. Those are important strengths to me. 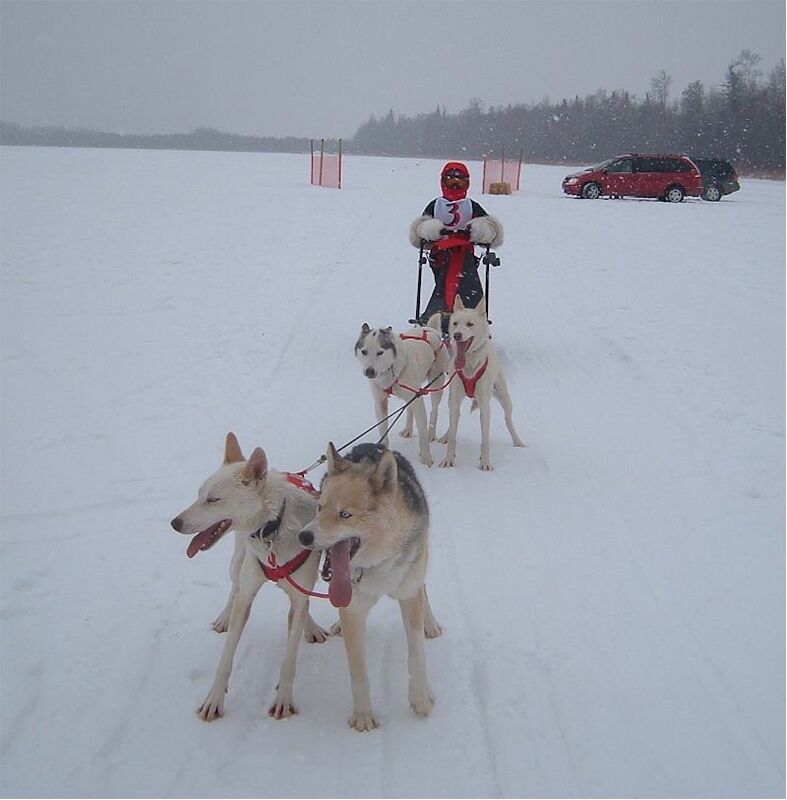 Also, looking back at what we were able to do starting out with a few Siberians and our skis, and comparing times with some of the other Alaskan teams, I realize I really do get a lot out of my dogs. I also feel that being highly competitive in sports my whole life, and always being chosen as team leader or captain for whatever team I was involved with, passes over to my leadership abilities and organizational skills with my dog teams. And quite honestly, I'd rather be captain of my dogs, than go back to high school and be captain of a bunch of girls ever again! Rob/Shelley: Our attachment to our dogs might be considered a weakness if we ever aim to be a top competitive kennel. We don't sell dogs but choose to work with what we have. However, we believe this puts us at an advantage to the guy/girl who might go out and purchase a top, harness broke, ready to run team. That person just read the introduction and back cover of the book. He missed the whole story in between. Even the top kennels out there now, had to start somewhere. But, they remain at the top and continue to win and change and evolve with the sport because somewhere along the line, they read the book. One day, we might purchase and sell dogs that way, but if we ever do, we'll have paid our dues and we'll know how to treat that top team to get the most out of it. Sometimes a weakness can turn out to be your greatest strength one day. Rob: I hope my kids will want to stay involved with us and the dogs as they get older. One can only hope and never push. 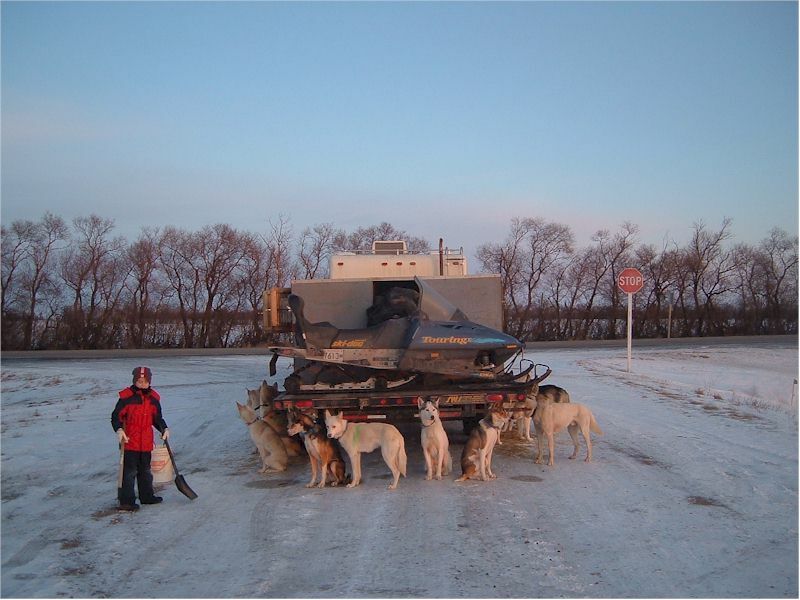 Shelley: I began a charity with my Siberians back in Saskatchewan and worked with at risk kids in the schools. I'll never forget what transpired between those troubled kids and the dogs. The dogs allowed the kids to think about nothing for a few moments out of that day. They lived in the now and smiled about it, just like the dogs. I'd love to have the opportunity to take in older dogs (not like we won't have enough of our own one day!) and provide time for children like that again, one day. And, I agree with Rob, I hope our children grow to appreciate and respect the dogs and sport. If this can't be, I hope they always have at least one loyal dog by their side. Rob/Shelley: You have to buy the best, breed to the best and move dogs that can't make your team. If you come up short in any of those three areas you can't stay at the top. When you have the best on your line, you have to know how to drive them. Rob: I see Skijoring / Bikejoring / Pulka / Canicross etc. being the more dominant and sociably acceptable disciplines for the future of mushing. I personally find distance and open class racing fascinating. Shelley: I would like to see some real life documentaries produced about the sport. Enough of these Disney, Hollywood movies. 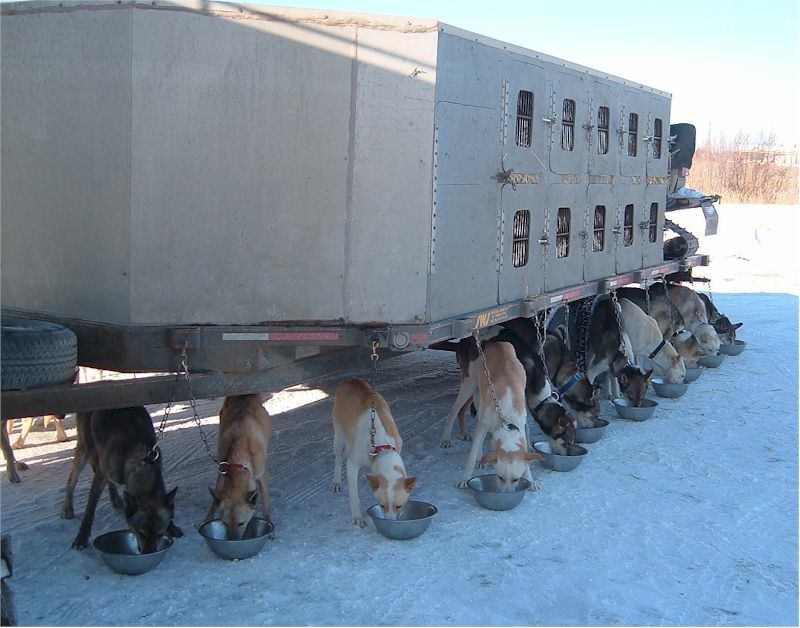 We need outlets to honestly and humbly show as many different facets and possibilities of sled dog sports. We need to spotlight the responsible overtures of our sport and market it as exactly that, "SPORT". We are athletes. I'd like to see more coverage of large events on TSN and other national stations. People will always continue to be fascinated with dog sledding and we need to start feeding that fascination and soon the broadcasters will begin to capitalize on it. I really believe sled dog sports are on the verge of exploding into the mainstream. It's a very exciting time. Rob: Take care of the Dogs. Clean up your mess. Shelley: All of the above, as well as take the time to educate anyone you can. Invite people into your yard. Help them understand about dogs on chains. Try to remain patient on the road, even when you're tired of the redundant questions and feeling like a travelling circus. We need to represent ourselves and sport as approachable and respectable. Not everybody is lucky enough to live with dogs. They are intrigued by it all. Rob: Critical. Without the clubs and organizations there are no races. Without races, we have no venue to attract spectators and future sport enthusiasts. Rob: Handle for different kennels (sprint/distance, etc.) 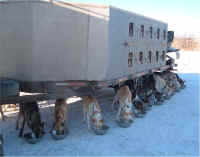 and find out what type of mushing is best suited to you and your lifestyle before acquiring dogs. Shelley: Get an education, or find a good job and make sure you can look after yourself in life before turning to dogs. The dogs will take over. If you don't have some kind of handle on your life beforehand, you may never get it once you get into these dogs. Also, ask questions, questions, questions. Most people who've been in the sport awhile have had several humbling experiences and will be glad to share any info they can with you. And, maybe don't be too quick to get rid of that trouble dog. You may learn more than you bargained for by working with him. And, again, agreeing with Rob in finding out what style of running you prefer and which type of dogs you will need to do this before you fill your yard and then realize you have to clean it out because your sprint dogs can't run mid distance. And PLEASE, don't go out and breed a bunch of mediocre dogs that no one will want to take off your hands if you decide you don't want them. There are good, no GREAT, dogs out there waiting for you. Go to a reputable yard and start with worthwhile bloodlines and learn for 10 years or so before you think about litters. Rob: The most memorable ones seem to all be related to "white knuckling" experiences and usually include poor trail conditions, the dark and too many dogs on the line...maybe throw in some wildlife. We tend to keep things a bit more controlled nowadays. Shelley: I have very limited comfort levels when it comes to running teams. My most memorable experiences are when I've pushed outside my comfort zones and challenged myself trusting our valuable training and experience with my dogs. My first 4 dog mass start, my first 6 dog team in a race, allowing myself to steer the corners rather than brake or drag them. Trusting my leaders in my first pass in a race. And then there's the days when it's all doomed. Losing my first team in the dark, having my team attack a stray dog sitting in the middle of the trail, missing my chute time as someone tried to help me hook up in a hurry scooping up my leader from behind scaring the daylights out of him only to have him bite ME in surprise! Every single time we hook up dogs to run is a story unto itself, though, isn't it. Shelley: We need to encourage more chiropractors and massage therapists (for humans) to volunteer their time at the races. I don't seem to be getting any younger.